We are being flooded, and our survival is threatened. No, it’s not water but something else just as deadly. We are being flooded by the negativity of the world, the selfishness of this animalistic world. You need only open your mail, or check your Facebook feed, to find a torrent of negative, hateful, venomous speech directed towards people who don’t think exactly as we do. Not Politics, sports, or any other human interest can validate a lack of respect and dignity among human beings. Make no mistake this age of twitter bombs, and cyber bullying has the potential to drown us all in our own self-interests, till we become so divided we simply cease to connect, learn and grow. That would be a sad day, a day that we are fast approaching unless we build ourselves an ark. 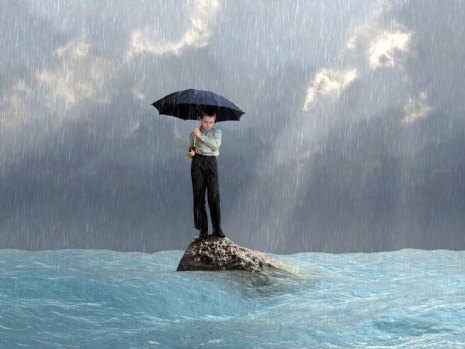 This week’s Torah portion is Noach, and here we read exactly how to prepare and survive a flood, even one of world-ending proportions. G-d tells Noach to build an ark and then enter it, to protect himself and his family from the onslaught of raging water. The Baal Shem Too comments on this verse, and tells us that herein lies the answer for us today, as we battle the flood waters of materialism and self centeredness. We too must build an ark, but not one made of wood. In Hebrew the word for ark is Teivah, and it also means “word”. To survive the flood of hateful speech, and negativity we see swirling around us, we must surrounds ourselves with the “word”. The words of Torah study, the words of prayer, these words have the power to uplift us beyond our animalistic selves, and refocus our view on life from a higher plane. To protect and preserve the altruistic qualties that define us as human, we must enter a world where we see ourselves and those around us as more then a political opinion, a friend or foe. Just as words have power to destroy us, so can they save us, if we choose them wisely. This Shabbat put your politics aside, and go to Shul for some communal prayer. Sit down by yourself, or with your wife and kids, and learn some Torah. I guarantee you’ll start to see the world around you differently. It’s the only way we can survive this modern day flood.